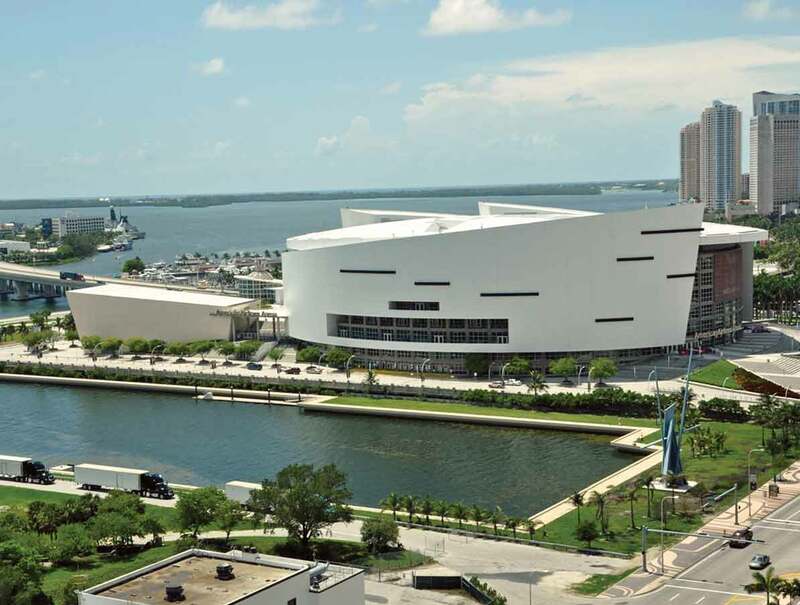 Miami’s growing improved baywalk could be extended to hug the FEC deep water slip and connect Museum Park to land beside AmericanAirlines Arena under a waterways project the city has floated. The city commission has authorized a grant request that would help fund the bulk of the baywalk extension. It was one many funding requests to the Florida Inland Navigation District (FIND) Waterways Assistance Program. Commissioners authorized City Manager Daniel Alfonso to apply to FIND for grants of up to $1.25 million to construct the baywalk on the south side of the FEC slip. The move also authorized allocation up to $1.25 million of the required matching funds for 50% of the project costs. The proposed $2.5 million project would construct a landscaped baywalk connecting Museum Park, the city’s newest park, and a small parcel adjacent to AmericanAirlines Arena on Biscayne Bay known as Parcel B. This land is owned by Miami-Dade County government. Museum Park is a 21-acre upland and seven-acre water site on Biscayne Bay seven blocks north of the city’s Bayfront Park. The park has undergone a major transformation, years in the making, and is again welcoming visitors after years of neglect when it was known as Bicentennial Park. Today, Museum Park envelopes two institutions: the Pérez Art Museum Miami, which opened in late 2013, and the Patricia and Phillip Frost Museum of Science, now under construction. Adjacent to the park’s south side is the seven-acre FEC slip, which also underwent renovations when the park was redeveloped. The seawall is designed to host tall ships and water dependent events. The baywalk is improved and landscaped on the north side of the slip and along its western edge. There’s not much on the slip’s south side beyond a sun-bleached path of concrete. Funds for the baywalk extension might not be awarded until after Oct. 1. City commissioners also approved about a dozen other requests for funds from FIND’s Waterways Assistance Program. For each project, the commission allocated the required matching funds for 50% of the project’s total cost. •Up to $25,000 for design and permitting of repairs to the seawall and boat ramp at Morningside Park – Phase I. This is to include a floating dock. •Up to $50,000 for the design and permitting of seawall and boat ramp improvements at Legion Park – Phase I. •Up to $150,000 to construct a seawall, baywalk and kayak launch at Pallot Park. •Up to $150,000 to install and upgrade Dinner Key Marina Pump-out Equipment – Phase II. •Up to $50,000 for the design and permitting of Miami Marine Park Marina Construction Project – Phase I. •Up to $500,000 for the construction of Marine Stadium Baywalk – Phase II. •Up $62,500 for the design and permitting of seawall and baywalk improvements at Alice Wainwright Park – Phase I. •Up to $375,000 to upgrade electrical systems in Miamarina – Phase II. •Up to $30,000 to remove small derelict vessels. •Up to $50,000 for the design and permitting of Bayside “Wharf” Project At Miamarina – Phase I. •Up to $75,000 for the design and permitting for a seawall and kayak launch at Spring Garden Park – Phase I. •Up to $25,000 for the design and permitting of seawall improvements at Baywood Park – Phase I.
read the news about a kayak loung at Point Park located in Spring Garden and I do not think the amount of street area for parking is sufficient to park vehicles with trailers to use the loung for their kayaks. This is a very tight squeeze for that type of activity.